When you’re sick you almost don’t want to wear any makeup but there are ways to manage makeup when you have a cold. Statistically there’s no increased risk of contracting a cold during the change of seasons, anecdotally, people often complain of getting sick this time of year. If the fatigue, aches, sore throat and generally yucky feeling are not enough to deal with when you’re sick, looking presentable becomes infinitely more challenging. Just when you really need to look a bit perky and less tired, managing makeup becomes a Sisyphean task- and cold-ravaged skin often feels a lot better clean and makeup free. In a perfect world, you could camp out in bed with some romance novels and apple cinnamon tea until you feel totally healthy- but chances are you’ll need to go to work, or to an event, or even to the store to stock up on NyQuil. Doing makeup when you’re sick or have a cold is a bit more difficult, but not impossible- try these tips while you heal. Moisturize like crazy. Nothing is as soothing when you’re sick as a nice, hot bath or shower. It clears your head and mitigates the schlumpy, groggy feeling. Try to moisturize as soon as possible after you towel off. 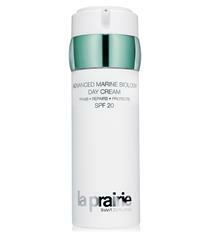 A thick, soothing moisturizer like Dermologica’s Intensive Moisture Balance or La Prairie Skincare Advanced Marine Biology Day Cream found at Beautique UK will help maintain skin hydration, but you might want to add a stick-style moisturizer, particularly around irritated areas like your nose. 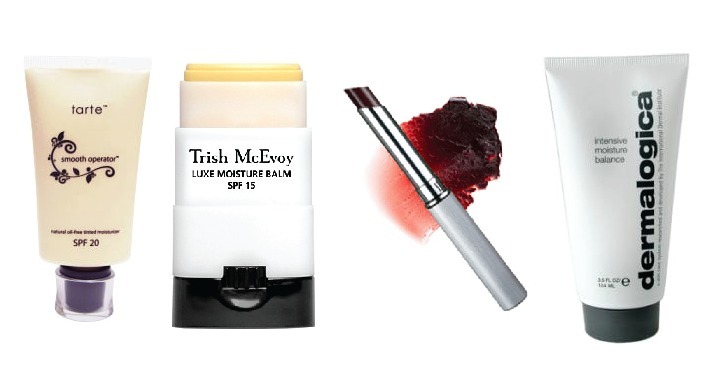 Trish McEvoy’s Luxe Moisture Balm is a good spot-soother. Fight flakes. During a cold, blotchiness and uneven skin are part of the territory, and frustratingly, foundation often rubs off or settles into dry or chapped areas. Even if you’re a mineral makeup queen, you might want to stick to a tinted moisturizer and a super-light dusting of setting powder until you’re better. Tarte’s Smooth Operator is a well-liked option, and Jemma Kidd’s Gossamer Finish Ultra Sheer Translucent Skin is finely milled enough to handle frequent touch-ups. Be conservative. Even something as routine as mascara can be a recipe for disaster when you’re under the weather. Consider forgoing intense eyes, although curling lashes always wakes up your face. Liner and pigmented shadows also not only migrate, but can irritate already itchy, watery eyes. Fake a healthy glow. After smoothing out skin tone, a bit of sheer blush and some soothing lip color will go a long way to minimize the overall washed-out look that comes along with being ill. Urban Decay’s Afterglow Glide-On Cheek Tint is sheer but pigmented. For lips, a tinted balm or sheer lipstick will add color without settling into flakes or cracks. Clinique’s Almost Lipstick in Black Honey is a cult favorite because it’s sheer and flatters everyone, and Lucy B. Cosmetics Stung Lips Tinted Balm comes in a nice range of rich hues. These tips will help you to look good when you have a cold. What’s your plan of attack for looking your best when you’ve got a cold? Do you have any go-to pick-me-ups? I’m hosting my first event in New York City! NYC Beauty Blogger Nicole Dantzler and NYC Fashion Blogger Kimberlee Van Der Wall present How to Green Your Beauty Routine. Join your fellow bloggers and editors for a appetizers while learning about the methodology to go green, green products and packaging from mySkin.com. 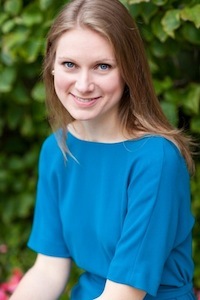 Jolene Hart of Beautyiswellness.com will talk about Beauty Food, how to beautify yourself from the inside out. 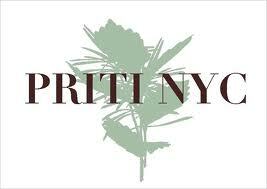 If you’re a beauty or fashion blogger in NYC, email nicole@lipstickandluxury.com for an invitation! 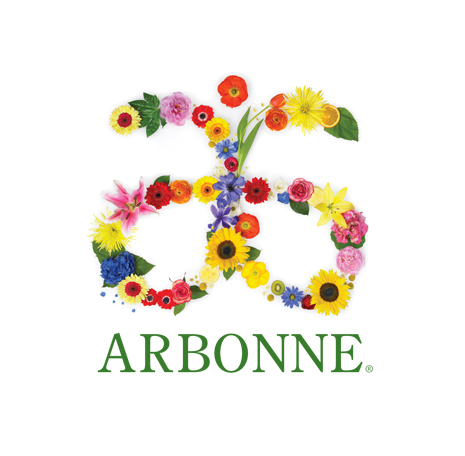 Gift Bags Sponsored by ARBONNE, Priti NYC, Sénica, tarte cosmetics, Zen Society Skincare, QiLiving and Zosimos Botanicals. Spring is finally here, and Easter, which is late this year, rapidly approaches. Pre-fab Easter baskets are crowding makeup off the shelves in drugstores, full of inexpensive toys and questionable quality chocolate bunnies with a single, staring sugar eye. Sometimes big girls get a decent quality box of chocolates or pretty flowers, but what would go in a beauty junkie’s ideal basket? Here are six things the Easter Bunny should consider in lieu of marshmallow chicks. 1.) Bubblegum pink Tarte TEN Natural Cheek Stain: Nothing is springier than bright pink blush, and this limited edition stain comes in an attractive, jeweled package. The saturated, wearable shade within is subtle enough to wear to work but adds a noticeable amount of cheek color in a creamy, blendable formula. A proprietary “super fruit complex” on the ingredient list contains goji, açaí and pomegranate. 2.) Super Chocolatey Angel by Thierry Mugler: I’ll admit that I’m pretty much a lifetime wearer of this controversial yet perennially popular fragrance. The unique blend of patchouli, honey, bergamot, vanilla, caramel- and yes, chocolate- certainly isn’t for everyone. Fans of subtle or clean-wearing fragrances generally don’t take to Angel, but if you want a sophisticated, foodie scent and like getting compliments on your perfume, this is possibly the most refined, grown-up and intoxicating chocolate perfume in fragrance history. 3.) Sweet Urban Decay Sparkling Lickable Body Powder in Marshmallow: It’s not bunny-shaped or chocolate covered and being “lickable” and flavored, it’s probably a product that’s really only for grownups. But Urban Decay’s Sparkling Lickable Body Powder in Marshmallow lasts way past when their Easter counterparts would have become stale and inedible, and leaves skin with a surprisingly subtle, sweet scented shimmer on exposed decolletage. The packaging, with a zebra print and tassled lid, is adorable, too. 4.) Grass-infused Bobbi Brown Hydrating Gel Cream: This hydrophilic, skin-plumping moisturizer has the added bonus of not getting strewn through every corner of the room and stuck to your jellybeans. In addition to nourishing tropical grass extract, it also contains reparative Vitamin E. But the high concentration of water-binding properties is really where this moisturizing gel shines. 5. and 6.) Adorably sweet Philosophy Sugar Chick and Philosophy Orange Jelly Bean Shampoo, Shower Gel & Bubble Bath: Philosophy’s famously multi-tasking bath products come in a massive range of limited edition and standard options, but these two would be absolutely perfect for a skincare and makeup themed easter basket. Who would have thought skincare and Peeps could converge so perfectly? A pastel tinted pedi and mint-green facial mask would be cute additions to a beauty basket, too. 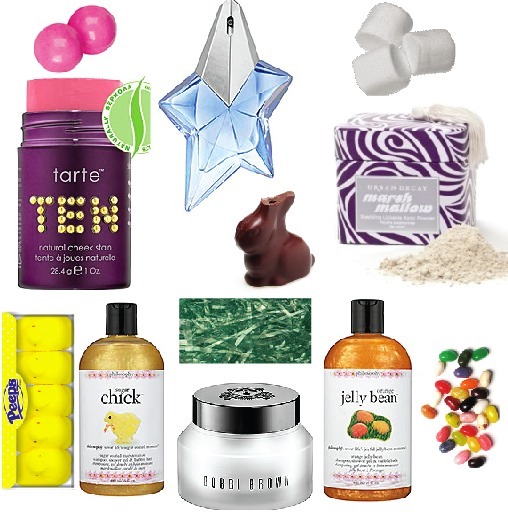 What beauty products would you like the Easter Bunny to hide in your eggs this year? I keep reading that pink is hot for Spring 2011. Which leads to the inevitable question- when is pink ever not hot? If you’re like me, there’s the inevitable point each winter where you go into cold-weather denial and you begin to gravitate toward super-springy shades, selecting cosmetics more geared for a sundress and glitzy sandals. As a makeup artist, I tended overall to shun browned down tones in favor of sheerer washes of pure color, and if there’s ever a time of year that’s more needed, it’s right now. Here are five pretty pink products that will pull you out of a winter-neutrals rut. 1.) MAC Pink Swoon: By no means new, this product is so deceptively bright in the pan. But brushed on to the apples of cheeks, whether you’re NC10 or NW45, this classic powder blush provides the perfect wash of sheer, true pink as if you’ve been skiing. Or briskly walking on a crisp March day. 2.) Too Faced Look of Love Set: Sets are like the all-you-can-eat sushi of the makeup world. You may not like it all, but OMG, it looks so cool on your plate. This one is really well rounded, with two primer products, a milky-pink gloss, a baby kabuki, a mascara, and a neutral shadow/pink blush trio in what honestly appear to be my three desert island shades. Plus a bag! 3.) Tarte LipSurgence™ natural lip tint in Amused: Tarte’s stains have a deserved cult following for their pure, pigmented color washes, sheer textures and wonderfully unique product shapes. This sheer, bright pink takes that concept and morphs it into pencil form in a color that looks audacious but wearable. 4.) Tweezerman Slant Tweezers in Pink: Okay, this one isn’t technically going to add color to your palette, but it’s here for two reasons. One is the color, of course, and one is that perfectly groomed brows are always an instant pick me up. And if you haven’t plucked with Tweezermans, the unrivaled precision really does help for a more comprehensively cleaned up brow shape. 5.) Benefit lady’s choice deluxe mini full-finish lipstick: Edging towards matte-iness, this is totally a Bardot or Marilyn pink. The mini-size is purse friendly, and the color is sheer enough to infuse lips with the pale hue without the effect of washing out your look. This particular product is also a freebie with a $40 Benefit purchase at Amazon right now if you use the code MINILADY. What’s your favorite cosmetic pick-me-up? Do you have a colorful favorite you inevitably dig out each Spring? 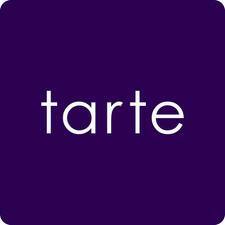 Tarte gives us a sweet treat! 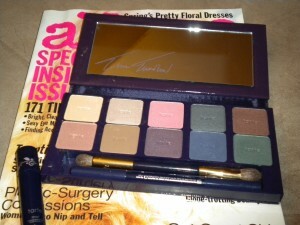 Tarte was sweet enough to introduce us to their limited edition flower child natural eyeshadow palette. 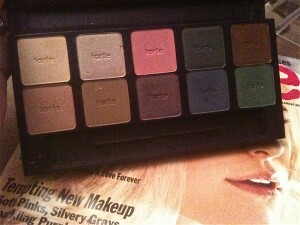 This is one of the prettiest palettes that i have come across in a long time. The shadows are showcased in a shiny purple refillable case with a magnetic closure. 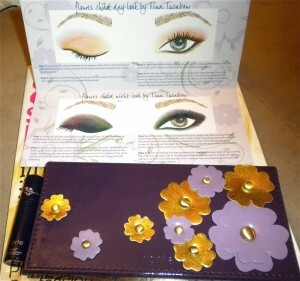 The outside of the case is beautifully adorned with purple and gold flowers. 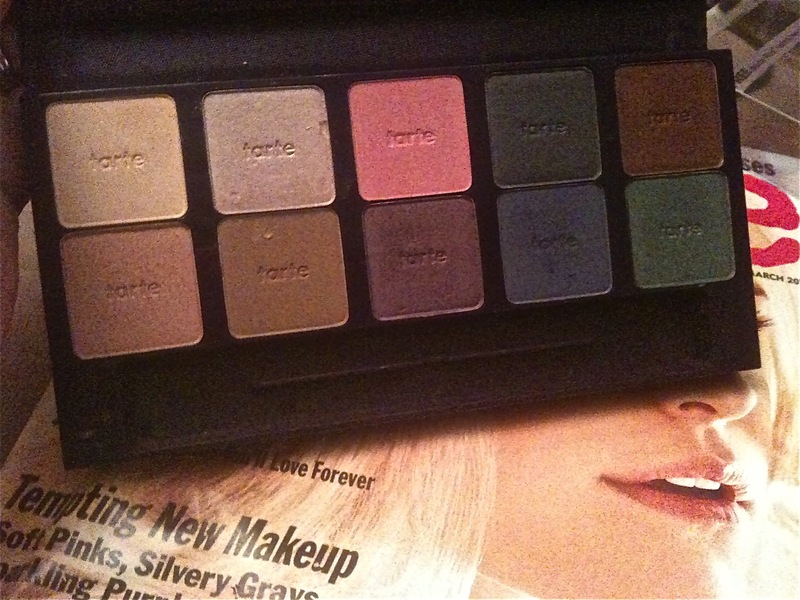 This palette also comes complete with “Lifted” which is a natural eye primer (said to decrease the appearance of fine lines and wrinkles by 51% in just 10 minutes), a double sided eye shadow brush and a double sided eyeliner in a Matte Brown on one side and Shimmering Jade on the other. The mirrored palette is filled with 10 shades of saturated pigments and the mirror is signed by the palette designer and celebrity makeup artist Tina Turnbrow. The shades are of course floral inspired: (top row left to right) soft daffodil, ecru hibiscus, pink peony, gray periwinkle, peach tulip, (bottom row left to right) firewheel, buttercup, african violet, delphinium blue and vibrant forest grass. What makes this palette unique? Well for starters this product is cruelty free so it’s not tested on animals. In addition to that wonderful fact the product consists of many beneficial ingredients such as grape seed extract, Vitamin A and Vitamin E, the shadows are made from mineral pigments and the colors apply very smoothly. I love that an inspiration card is enclosed to give you an idea of how to play up the colors for day or evening. The cost of this eco friendly refillable palette is $44 including the brushes and the shadow primer so it’s really worth the cost. 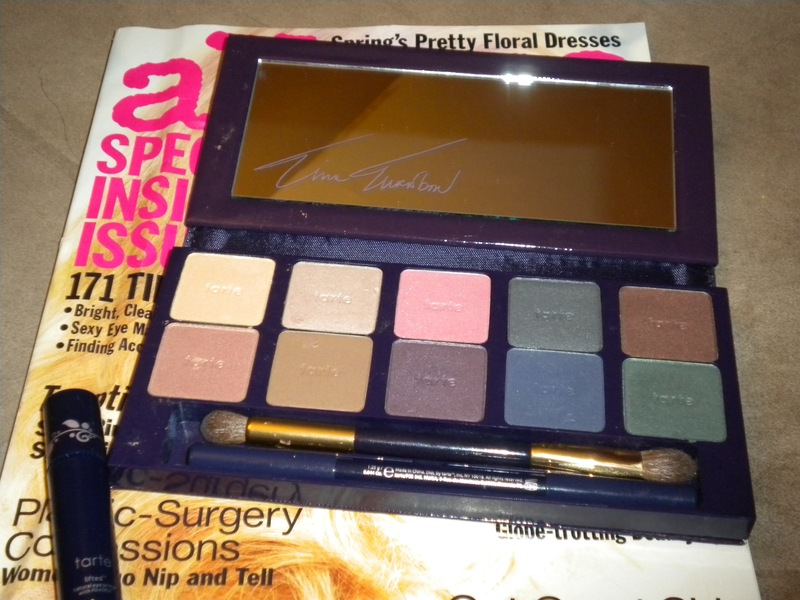 This palette is one of my favorite Spring purchases because not only is the case gorgeous (and refillable) but the color spectrum gives you a lot of flexibility to create a natural look or a smoky eye.